I believe the first moments with your new baby are extremely important. You’re meeting your baby after having waited 9 long months to see the color of her eyes, her hair…her smell. The last thing I want to do is be an intrusive salesman that makes your session terribly uncomfortable. I strive to get in and out within 15 minutes, tops, so you can get back to learning what it’s like to be a brand new mommy. My goal is to capture your baby’s beautiful perfections exactly as she was the day you met her! I will never try to sell you anything in your room. I will simply take her photos and hand you instructions on how you can find them online when you’re comfy at home. It really is THAT easy! I promise you will fall in love with your photos because your baby will never be that tiny again. 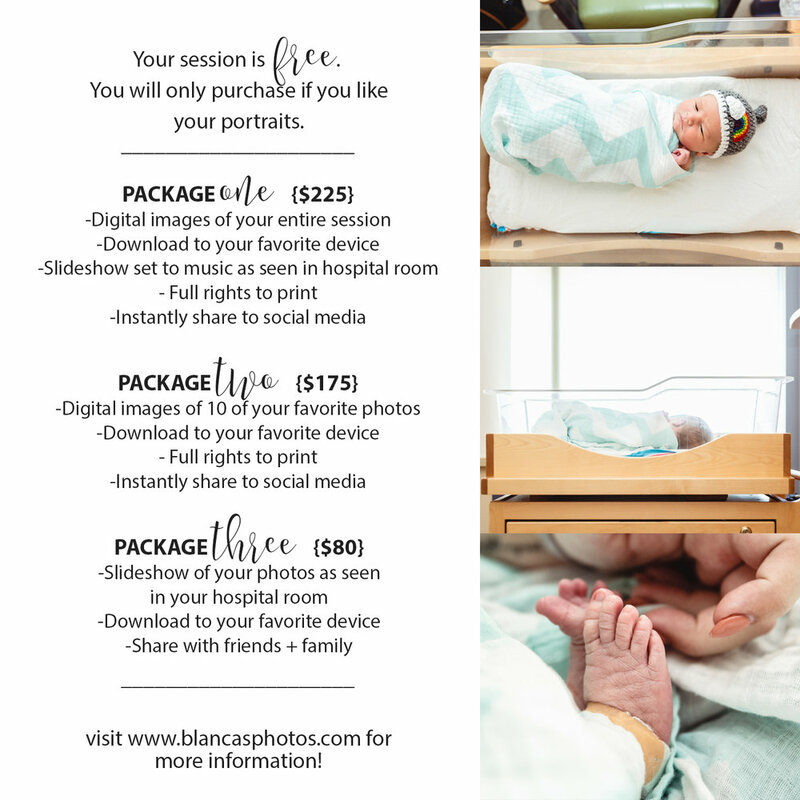 Your newborn session is FREE at participating hospitals. Yes... FREE. I take your photos right in your room while I’m there. My goal is to make your baby’s very first photo shoot beautiful, pressure free and comfortable. I’m a terrible salesman, so there is no sales on-site. I take your baby’s photos and go about my day. You can view your baby’s photos and slideshow at your convenience when you’ve had time to settle in with your baby at home. You always have the option to purchase your digital images in the comfort of your home! Q: When and where will my session take place? A: I will take your baby’s photos in your room. I prefer not to take photos on the same day your baby is born. I believe the very first day should be savored between you and your baby without interruptions. I will come by your room or you can call me to schedule the day after your baby is born. A: Sessions usually last 15-20 minutes. A: The session is free, and I will give you instructions on how you can view your photos online and purchase at a later time. A: Nothing! I have some nice swaddles and hats with me at all times. But if you have an item you absolutely must have in your photos, please be sure to let me know. Q: What if I’m already at the hospital and I didn’t plan for photos or I left my hospital bag at home? A: Don’t worry! I have a few beautiful swaddles and items we can use for your baby’s shoot. Q: Can other family members be included in the shoot? A: Yes! I encourage both parents and siblings to participate. Q: What if my baby is in the NICU? A: I will gladly accommodate NICU sessions whenever possible. Contact me to book your session. Q: How do I schedule my session?